Fluorescent lamps have been suggested to affect human health in various ways. New lighting systems have not used magnetic ballasts since the turn of the century, however some older installations still remain. Fluorescent lamps with magnetic ballasts flicker at a normally unnoticeable frequency of 50 or 60 Hz. This flickering can cause problems for some individuals with light sensitivity and are associated with headaches and eyestrain. Such lamps are listed as problematic for some individuals with autism, epilepsy, lupus, chronic fatigue syndrome, Lyme disease, and vertigo. Newer fluorescent lights without magnetic ballasts have essentially eliminated flicker. Individuals with high flicker fusion threshold are particularly affected by these obsolete, electromagnetic ballasts: their EEG alpha waves are markedly attenuated and they perform office tasks with greater speed and decreased accuracy. Ordinary people have better reading performance using frequency (50–60 Hz) electromagnetic ballasts than electronic ballasts, although the effect was large only for the case of luminance contrast. Early studies suspected a relationship between the flickering of fluorescent lamps with electromagnetic ballasts and repetitive movement in autistic children. However, these studies had interpretive problems and have not been replicated. An open (single envelope) CFL. Some fluorescent lamps emit ultraviolet radiation. 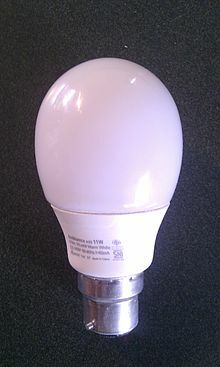 The Health Protection Agency of the United Kingdom has conducted research concluding that exposure to open (single envelope) compact fluorescent lamps (CFLs) for over 1 hour per day at a distance of less than 30 cm can exceed guideline levels as recommended by the International Commission on Non-Ionizing Radiation Protection (ICNIRP). Not all open CFLs produce significant UV emissions. However, close proximity to bare skin can result in exposure levels similar to direct sunlight. The Health Protection Agency of the United Kingdom recommend that in situations requiring close proximity to the light source, open (single envelope) CFLs be replaced with encapsulated (double envelope) CFLs. Ultraviolet radiation emitted by fluorescent lighting can increase an individual's exposure to carcinogenic radiation by 10 to 30 per cent per year, with an associated increased probability of contracting squamous cell carcinoma by 4 percent. Melanoma has been shown to not be affected by CFLs through normal use. The constituent high-energy visible light (some blue light) of CFLs can aggravate retinal diseases in susceptible people, but it is unlikely to occur. The report states that "people with autism or Asperger's syndrome have reported problems which they attributed to fluorescent lighting and any deleterious effects on sufferers of autism or Asperger Syndrome from CFLs cannot be dismissed. The inner-ear condition Ménière's disease can be aggravated by flicker. Sufferers of vertigo are recommended to not use fluorescent lights. Polymorphous light eruption is a condition affecting the skin thought to be caused by an adverse reaction to ultraviolet light. Its prevalence across Europe is 10-20% of the population. Artificial light sources may provoke the condition, and CFLs have been shown to produce an eruption. Chronic actinic dermatitis is a condition where a subject's skin becomes inflamed due to a reaction to sunlight or artificial light. Its prevalence in Scotland is 16.5 per 100,000 population. There is evidence that CFLs worsen the condition. The autoimmune disease lupus is exacerbated by CFLs. There is evidence that actinic prurigo is worsened by CFLs. This disease affects 3.3% of the general population. 3.1% of the population suffer solar urticaria, a skin disorder affected by ultraviolet light. Some patients are directly affected by CFLs. Phytophotodermatitis may be aggravated by the additional levels of ultraviolet light emitted by CFLs. Patients undergoing photodynamic therapy are at additional risk of adverse photosensitive reactions caused by CFLs. Self-reporting suggests that 21% of chronic fatigue syndrome patients experience sensitivity to light but there have been no studies into the association between chronic fatigue syndrome and CFLs. One cause of cataracts is exposure to ultraviolet light. Provided the level of UV emission from lamps is within safe limits, and the lamp a sufficient distance away from the individual, there should be no increased risk of developing cataracts. There is evidence that flicker can cause seizures in patients with photosensitive epilepsy, but there has yet to be any evidence to date attributing seizures to compact fluorescent lamps. Self-reporting suggests fluorescent lamps aggravate dyslexia, but tests show that dyslexic patients are unable to detect flicker emanating from light sources. This opinion was updated by SCENIHR in 2012, with no significant changes from the opinion of 2008. Fluorescent bulbs contain mercury, a toxic substance. The United States Environmental Protection Agency (EPA) provide safety guidelines for how to clear up a broken fluorescent bulb. Mercury can be harmful to children and developing fetuses, so children and pregnant women should avoid being in the area whilst a broken bulb is cleared up. Bulbs which have reached the end of their life should not be disposed of in normal trash, as this may release the mercury into the environment if the bulb is damaged. Several countries have specialised recycling or disposal systems for fluorescent bulbs, e.g. US bulb recycling. According to the U.S. Environmental Protection Agency (EPA), the amount of mercury contained in a compact fluorescent lamp (about 4-5 mg) is approximately 1% of the amount found in a single dental amalgam filling or old-style glass thermometer. Some linear fluorescent lamps contain reduced mercury (as low as 1.7 mg) and are typically termed as “Green” and are recognizable by their green caps/tips. The U.S. EPA states that using energy-efficient CFLs reduces demand for power, which reduces the amount of coal burned by power plants and hence reduces the amount of mercury emitted from coal fired power plants. In rare cases individuals with solar urticaria (allergy to sunlight) can get a rash from fluorescent lighting, although this is true of any source of light. Very photosensitive individuals with systemic lupus erythematosus may experience disease activity under artificial light. Standard acrylic diffusers over the fluorescent lamps absorb nearly all the UV-B radiation and appear to protect against this. One paper suggested that in rare cases, fluorescent lighting can also induce depersonalization and derealization; subsequently, it can worsen depersonalization disorder symptoms. The charity Migraine Action Association reported concerns from members that CFL bulbs can cause migraines,[dead link] and there are many anecdotal reports of such occurrences. ^ Shadick NA, Phillips CB, Sangha O, et al. (December 1999). "Musculoskeletal and neurologic outcomes in patients with previously treated Lyme disease". Annals of Internal Medicine. 131 (12): 919–26. doi:10.7326/0003-4819-131-12-199912210-00003. PMID 10610642. ^ "Accommodating People with Vertigo". Archived from the original on 2008-06-08. ^ "Flickering Fallacy: The Myth of Compact Fluorescent Lightbulb Headaches". Scientific American. Retrieved 2017-12-07. ^ Küller R, Laike T (1998). "The impact of flicker from fluorescent lighting on well-being, performance and physiological arousal". Ergonomics. 41 (4): 433–47. doi:10.1080/001401398186928. PMID 9557586. ^ Colman RS, Frankel F, Ritvo E, Freeman BJ (1976). "The effects of fluorescent and incandescent illumination upon repetitive behaviors in autistic children". J Autism Child Schizophr. 6 (2): 157–62. doi:10.1007/BF01538059. PMID 989489. ^ Turner M (1999). "Annotation: Repetitive behaviour in autism: a review of psychological research". J Child Psychol Psychiatry. 40 (6): 839–49. doi:10.1017/S0021963099004278. PMID 10509879. ^ "Philips Tornado Asian Compact Fluorescent". Lamptech.co.uk. Retrieved 18 June 2013. ^ "Emissions from compact fluorescent lights". Health Protection Agency. 2008. Archived from the original (PDF) on 2008-10-13. Retrieved 2009-08-31. ^ "Executive Summary: Report on Health Canada Survey of Ultraviolet Radiation and Electric and Magnetic Fields from Compact Fluorescent Lamps" (PDF). Canada. 2009-12-21. Retrieved 2016-06-15. ^ "Light Sensitivity, Scientific Committee on Emerging and Newly Identified Health Risks" (PDF). Director-General for Health and Consumers, European Commission. 2008. pp. 26–27. Retrieved 2009-08-31. Although the carcinogenic UV dose from fluorescent lighting in offices is minor (~ 1%) when compared to equal exposure times in the summer sun, old risk assessments showed that actual annual exposures of office workers could increase by 10 to 30% from the fluorescent lighting, which over a lifetime was estimated to increase the risk of squamous cell carcinomas by around 4% with a baseline risk much lower than that for outdoor workers who dominate incidences (Lytle et al. 1992). ^ Mattsson M-O; et al. (2012). "Health Effects of Artificial Light" (PDF). Scenihr. ^ , US Environmental Protection Agency. Last updated on 12/29/2014. Retrieved on May 08, 2015. ^ "Fluorescent Lamp Disposal and Recycling" (PDF). Fluorescent lamps that are not low-mercury or green-marked are generally considered to be regulated hazardous waste after their useful life. ^ John Balbus (July 31, 2007). "Mercury Risk in CFLs: The Facts". Environmental Defense Fund. Retrieved March 9, 2018. ^ "Philips Lighting introduces revolutionary new Alto II linear fluorescent lamp technology". www.ledsmagazine.com. ^ "Management of "Green" Fluorescent Bulbs - Wisconsin DNR" (PDF). ^ Beattie PE, Dawe RS, Ibbotson SH, Ferguson J (2003). "Characteristics and prognosis of idiopathic solar urticaria: a cohort of 87 cases". Arch Dermatol. 139 (9): 1149–54. doi:10.1001/archderm.139.9.1149. PMID 12975156. ^ Rihner M, McGrath H Jr (1992). "Fluorescent light photosensitivity in patients with systemic lupus erythematosus". Arthritis Rheum. 35 (8): 949–52. doi:10.1002/art.1780350816. PMID 1642660. ^ Simeon D, Knutelska M, Nelson D, Guralnik O (2003). "Feeling unreal: a depersonalization disorder update of 117 cases". Journal of Clinical Psychiatry. 64 (9): 990–7. doi:10.4088/JCP.v64n0903. PMID 14628973. ^ a b "EU phases out low efficency (sic) light bulbs". Migraine Action. 2009. Retrieved 2009-09-04. However as reported regularly by Migraine Action, there are concerns - voiced by many members - that the new bulbs can cause migraines. ^ "Low-energy bulbs 'cause migraine'". BBC. 2008-01-02. Retrieved 2009-09-04. ^ "Phasing out 100W lightbulbs 'could damage health of Britons'". London: Daily Telegraph. 2009-08-31. Retrieved 2009-09-04. This page was last edited on 2 March 2019, at 16:01 (UTC).